Nepenthes rigidifolia first started out as N. species #6 that originated from Malesiana Tropicals. After a while, they began referring to this plant as N. aptera. I even heard the name N. alpicola for a brief time as well. Finally it ended up being called N. rigidifolia. Malesiana Tropicals was the first to release it but now Borneo Exotics released some last year but since then, no new plants have been available. Now that I've had this plant for quite some time, it's beginning to produce nice large pitchers. It does fine for me all year around outdoors but is a bit of a slow grower. There are no side shoots and isn't in the vining stage yet. 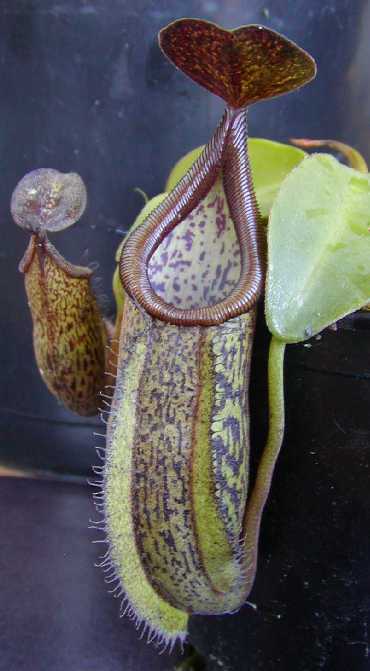 This plant produces a pitcher every leaf for me and they are long lasting too. It's strange that this species and N. glandulifera seem to have vanished from the market. Maybe because Malesiana Tropicals hasn't been as active in the Nepenthes community is a big reason why these species have been absent.